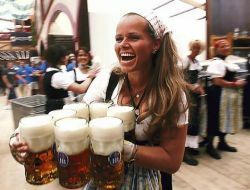 If you are planning on heading to Bavaria for the giant celebration in honor of beer, but are trying to stick on a tight budget, you may be looking for hostels near Oktoberfest in Munich (less money on accommodations = more money for beer). While hotel rates also tend to jet jacked up during the festival, with a little time, energy and searching, you can also find a cheap hotel in Munich if you would rather skip the shared bathrooms and hostel party atmosphere. While the millions of visitors who flood into Munich each year for festival will not get you away from the crowds usually missing during fall travel in Europe, this time of year is still an ideal time to get cheap flights to Munich and enjoy fall discounts. If you would rather book everything together as part of a Europe vacation package, EuropeASAP is offering a six-night Munich Fall City Special starting at $1,049 per person (without taxes and fees). The deal, which includes round-trip airfare from New York City (other departure cities are available for a higher cost), six nights’ accommodations, daily breakfast, and hotel taxes and surcharges, will have you drinking a pint before you can say lederhosen. Travel is valid until October 25, but you must book by September 28. If your budget is super low, but you’d still love to revel in celebration of beer in Germany, there are also a few other smaller, cheaper and more subdued beer festivals in Germany. Read more about Oktoberfest travel deals to find out where you can drink beer and party hardy without emptying your bank account this fall.